One of the world’s most secure and easy to use bitcoin wallet can be found at choosecase.com. Case was designed by Case Wallet Inc, as a solution to facilitate the exchange of bitcoins. As the company states: “At its current state, bitcoin is very hard to use” and that is why Case had been developed. The hardware wallet aims to serve as mean to encourage the use of bitcoin in our everyday lives and given its design and features it can definitely do that. 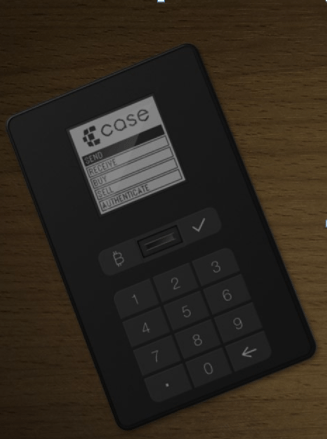 Case has a unique design that makes us remember about those calculators used to make math operations in school. It is the size of a credit card and it does not require a connection to a mobile device, because it has a built-in GSM chip that makes possible the connection to the server. It has open source firmware and multisignature security, which makes the lives of hackers very hard. • Verify the fingerprint and that is all. There are not too many hardware wallets with build-in fingerprint scanner and that is certainly a big plus. However, the fact that the device only can process bitcoin transactions is definitely a big minus, since other crypto currencies are gaining more popularity these days. The device is available for a price of 199 US dollars, plus the shipping fee. It is also very interesting how this device actually works. Case connects to the internet via GSM and the bitcoin amount is sent through the device, authenticated by a finger swipe. You can also use Case to buy bitcoin directly from within the wallet and it has an extremely convenient and secure sending mechanism. In terms of the weak points, Case is relatively expensive and it does not really offer cold storage. As a whole, Case in a hardware bitcoin wallet with a nice design, it incorporates a fingerprint scanner and does not require a third party application, installed on your computer or your mobile device. Summary: One of the world’s most secure and easy to use bitcoin wallet can be found at choosecase.com. Case was designed by Case Wallet Inc, as a solution to facilitate the exchange of bitcoins. As the company states: “At its current state, bitcoin is very hard to use” and that is why Case had been developed. The hardware wallet aims to serve as mean to encourage the use of bitcoin in our everyday lives and given its design and features it can definitely do that.